My family loves Cracker Barrel! We are creatures of habit so, whenever we go, I know who is going to order what before the menus are even opened (why do we even bother to look?). 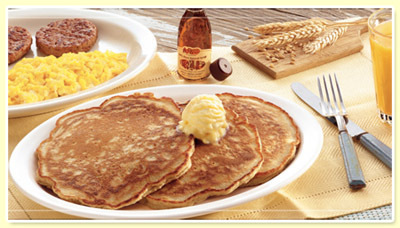 Morning, afternoon, or evening, my husband and kids will order breakfast- specifically pancakes. I was thrilled to see that their new menu items included mulitgrain pancakes. Scott ordered the stack that actually had granola in them and they were delicious. Pair these pancakes with the turkey sausage, egg whites, or put a dollop of peanut butter on top, and you have a great meal! I e-mailed them to see if I could get the calorie count and/or ingredient list for the pancakes, but they said that, because of various ways of ordering their menu items, they do not give out this information. So, my suggestions to keep the calories down is to eat only half the stack or share with someone, skip the fruit toppings and whipped cream, hold the butter, and just go easy on the syrup (I love that they serve the REAL stuff!). Enjoy your Saturday morning without overindulging whether you go out for pancakes or make your own whole grain pancakes.